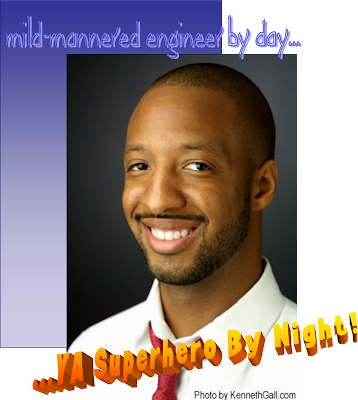 We’re pretty sure that Varian Johnson is a Super Hero in disguise. He’s a mild-mannered engineer by day, then he busts out with his YA chops by night – which qualifies as pretty super to us. He graduated from the University of Oklahoma with a degree in Civil Engineering AND he’s enrolled in the Vermont College MFA Program for Writing for Children and Young Adults. Talk about a guy with dual identities! In 1992, Teen Talk Barbie burbled "Math class is tough!" But Rhonda Lee would beg to differ. In Varian Johnson's most recent novel, My Life as a Rhombus, first person narrator Rhonda Lee is good with the quadratic equations, imaginary numbers, and complex calculations, but her life contains a number of challenges much less cut-and-dried than mathematics. We loved the gorgeous cover of this book, we were intrigued with Rhonda Lee as a drama-dodging, smart-girl diva, and we were further intrigued by the choices Varian Johnson made as a writer about her character and the situations she faced. Ethnicity, social status, family, and friendship issues loom large in this novel, and we couldn't help asking hard-hitting questions about some of the most thought-provoking aspects of the story. Fortunately for us (and for our readers), much like his characters, Varian Johnson has risen to the challenge. Okay, so he doesn’t like tofu. We forgive him. He’s a Texan, and that 'steak' thing is in the blood. He’s got a sharp mind and a nice smile, and we’re more than happy to welcome him to Finding Wonderland and the Summer Blog Blast Tour. FW: Do you remember the first words you wrote for My Life as a Rhombus? Where were you when you wrote them? Did they change, or stay the same? The first words I wrote for Rhombus were, “Are you Rhonda Lee?” At the time, Rhonda was still a math tutor, but she was tutoring David (then named Isaiah). Sarah was still David’s brother, but she was a spunky eleven-year-old, not the character that we see today. I was living in Dallas when I first started the novel, way back in the summer of 2003. It’s changed a lot since then, but the core part of the story is still the same. Likewise, the opening chapter is still very much the same. FW: Rhonda and Maxine are the main characters in your two novels – both girls and both carrying a tremendous chip on their shoulders. Do you think you’d portray a Ron and a Max with the same angst and anger? What did you do as a writer to give yourself more of an insight into young adult girls? I think Maxine portrays her anger in a much more sarcastic, and perhaps even self-deprecating way, than Rhonda. I wanted Rhonda to express her anger in a scientific, controlled manner—yet I still wanted to give Rhonda an “out” every now and then to react to something in a totally unscientific way. During the time I worked on the novel, I was a member of a critique group made up of mostly women. In addition, I asked a few female family members and friends to read early drafts. Everyone was quick to let me know when something didn’t quite work. FW: Wow, the sole man in a critique group full of women? That must have been an unique experience! Obviously it worked out well! As a lover of tofu, TadMack has to defend her girls from Rhonda’s criticism! It seems that both Rhonda and her father blame wealth and privilege for Rhonda’s early downfall. Do you feel it’s more important to discuss class than race with young adults? Tofu? Blah! Give me a steak sandwich any day! I think both class and race are still important. However, with Rhombus, I was more interested in exploring the differences in social status within an ethnicity than problems solely tied to race. Rhonda, Sarah, David, and even Gail to a degree, are products of their environment. While their race has affected them, it’s their (and their parents’) different social statuses within the community that really affects how they see each other. The adults in Rhonda’s life are pretty complex and full of their own issues – Rhonda’s Dad maintains a double standard with regard to his sexual behavior and hers, and Sarah’s mother uses her position as a Supreme Court Justice to get enough information to blackmail Rhonda (which was really scary). Did you add conflict to the adults’ lives for a specific reason? In your experience do young adult novels depict adult lives as generally problem-free? As parents are an integral, necessary part of teenagers’ lives, I think parents are an important part of the young adult novel. Things don’t get easier for a parent just because they are older, have a job, etc. And while most parents try to do the right thing, like teenagers, they sometimes get it wrong. FW: That’s a really good point. Rhonda defends David’s violence toward Johnnie by telling Sarah “it’s in his nature to take care of you,” but a moment later argues that David beating up Christopher is “a funny way” of showing his love for her. Rhonda obviously disagrees with the idea that loving her means beating down the people who offend her, but what do you think she would describe is a boyfriend’s role in a relationship? I think Rhonda is still figuring out want she wants out of a boyfriend. I think she leaned on Christopher too much emotionally, and when that relationship went bad, she closed herself off from all male relationships. Right now, I think Rhonda would describe a boyfriend’s role as just “being there” for her—not necessarily fighting her battles, but just being there for support. As she gets older, I would hope that she would see that some battles are easier to win when two people are fighting instead of one. FW: We were surprised to see Rhonda prevent her father from confronting Christopher or his family. Why did she choose to protect him? What do you see as the role of fathers in this story? I think Rhonda still cared for Christopher at the time she chose to protect him. While she and her father were somewhat close before her pregnancy, they still had a strained relationship, as Rhonda’s father struggled to deal with her mother’s death. I think Rhonda was looking for emotional support from someone—anyone—and that just happened to come along in the form of Christopher. As I said before, I don’t see Rhonda’s father as a bad guy, I just see him as a guy trying to protect his daughter. He doesn’t always get it right, but all of his actions stem from his love for his daughter. FW: Rhonda finally being able to cut down her food intake because of David and to confront Christopher for David’s sake points to how she really feels about him – and how little she values herself. When she finally takes action for herself, it seems almost anticlimactic – during the writing process, did you consider her taking other options than throwing the rock? I did consider a few other options, but I felt that Rhonda didn’t need to do anything else in the scene. I think she’s too smart to engage in something worse with Christopher, like resorting to something more physical. I think she realizes that it won’t do her any good to hurt Christopher just to get even. While she doesn’t necessarily forgive him, she comes to realize that it’s time to let the past stay in the past. FW: Rhonda is an intellectual who enjoys math, and her friends are all unique or unusual in other ways. What attracted you to writing about characters that are out of the mainstream? Do you find yourself gravitating towards writing about particular types of characters? Well, I majored in engineering in college, so I was really attracted to the idea of writing a novel that featured three-dimensional characters that happened to like math. At the time, I hadn’t seen many novels that reflected this. Of course, a few months after I sold the novel, both John Green’s An Abundance of Katherines (Dutton, 2006) and Wendy Litchman’s Do the Math: Secrets, Lies and Algebra (HarperTeen, 2007) came out. I don’t know if I gravitate toward any particular type of character. However, I fully admit to being a fan of contemporary fiction. 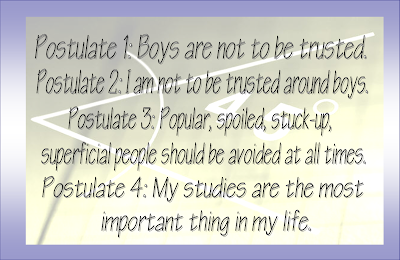 Perhaps I’ll try another genre one day, but for now, it’s all about realistic YA. FW: Did your own experiences in young adulthood affect your choice of subject matter or themes in your writing? If so, how? What drew you to writing for young adults? What projects are you working on now? I think most YA authors find that their childhood affects their writing in some way—although for me, it’s hard to pinpoint one specific thing. If anything, when I look back, I realize just how important my high school years were in shaping the person that I am today. That’s probably why I enjoy writing YA so much—it’s a way to explore feelings and ideas when a teen is just experiencing them for the first time. For the next few months, I’ll be finalizing my next novel, tentatively titled The Path of the Righteous. The easiest way to summarize it is that it’s a coming of age story about a preacher’s kid. After that, I’ve got a few other projects that I’m tinkering with, but I’m not far enough along to speak confidently on them. FW: What’s one thing you never get asked in interviews that you’d like your readers to know about you? Most people don’t know that when I first thought about writing My Life as a Rhombus, I considered writing it as an adult novel from Rhonda’s father’s point of view. But very quickly, I realized that this was Rhonda’s story, and if anyone was going to tell it, she was. FW: Definitely. A strong woman like Rhonda has a strong voice, and tell it, she did. As usual when we've finished an interview, we think of 1001 OTHER questions we could have asked, like, 'Where and how to do you write? How do you juggle your writing with your day job? What has been your family's response to your work?' However, the main point of the SBBT is to pique everyone's interest and to remind them of just how many great books there are out there to read and share. THANK YOU so much for stopping by and giving us a bit of your time! We wish you creativity and excitement and a long, long career in the superhero -- er, YA writing business! This has been an amazing week! Colleen at Chasing Ray has a list of EVERYTHING from the past week, so if you've gotten behind, visit the list and catch up! Your spiffy custom graphics are awesome and add a lot to your posts. I enjoyed this interview a lot - it's always interesting to me when guys write female main characters (and vice versa) to find out how they went about it, etc. Did you guys just make me want to read a noved with MATH in it? Yeah, I think you did. Well-played, TadMack; and nice to meet you, Varian Johnson. Varian, I loved your book! The book designer/art director did a great job on the chapter headings. Thanks for interviewing me. The graphics that you guys came up with are amazing! I really need to stop reading these wonderful interviews, its starting to get expensive. Is it superficial of me to say that Varian Johnson should be one of Fuse #'s Hot Men of Children's Literature? I know that series is defunct, but still.... HMOCL! I have Rhombus on my to-read-and-review stack right now. This great interview just moved it to the top. And I love your graphics too!